The MFQ-P shows convergent validity with other measures of child depressive symptomatology, like the Children’s Depression Inventory (CDI) and the Diagnostic Interview Schedule for Children (DISC). The present measure also has high internal consistency and a unidimensional factor structure. The MFQ-P can also discriminate between clinically depressed and non-depressed children. 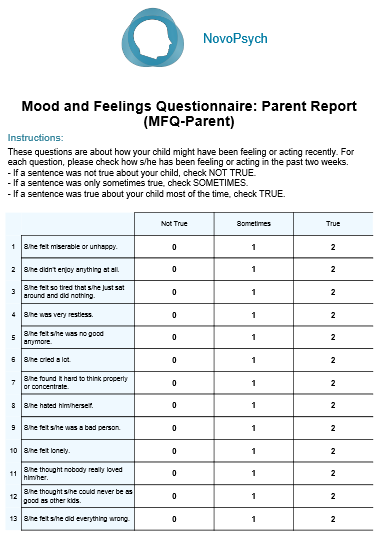 It should be noted that when the MFQ-P score is combined with the self-report version score for the same child, there is better depression status discrimination with the combined score than with either measure alone. The measure was also validated by Rhew et al. (2010) in a sample of parents of 521 sixth grade students with an average age of 11.5. After independently diagnosing the students they found that the MFQ-P was moderately accurate at discriminating depressed and non-depressed children. This study provided data for a non-depressed sample (n = 476) and depressed children sample (n=36). Scores on the MFQ-P range from 0 to 26, with higher scores indicating greater depressive symptomatology experienced by the child. Data is also presented as percentile ranks that compare scores to parent reports for depressed and non-depressed children (Rhew et al, 2010). Analysis of sensitivity and specificity data saw a cut-off score of 11 (Thapar & McGuffin, 1998). 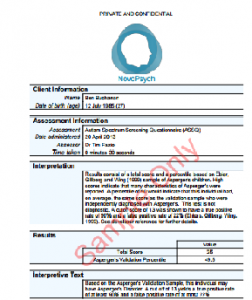 That is, a child who received a rating of 11 or higher from their parent on the MFQ-P is likely to have depression.